Welcome to A Very GBH Thanksgiving. 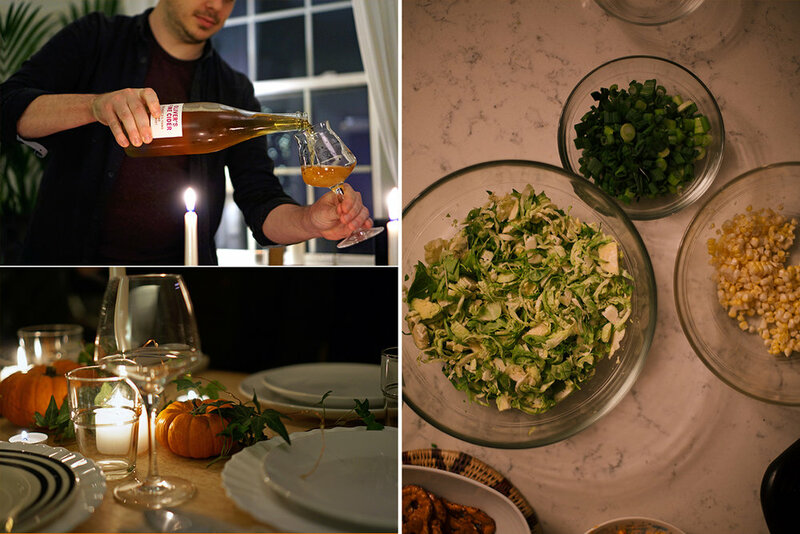 This week, we’re using our Provisions category as an excuse to indulge a’la the season: five courses—soup/salad, vegetable side dish, starch, main dish, dessert—over five days, with some tasty beverages sprinkled along the way. A pair of our most food-centric writers—one in London, one in Chicago—are teaming up to create this GBH-endorsed Thanksgiving feast. Please enjoy, make it your own, and don’t forget to show some gratitude over the next couple weeks. 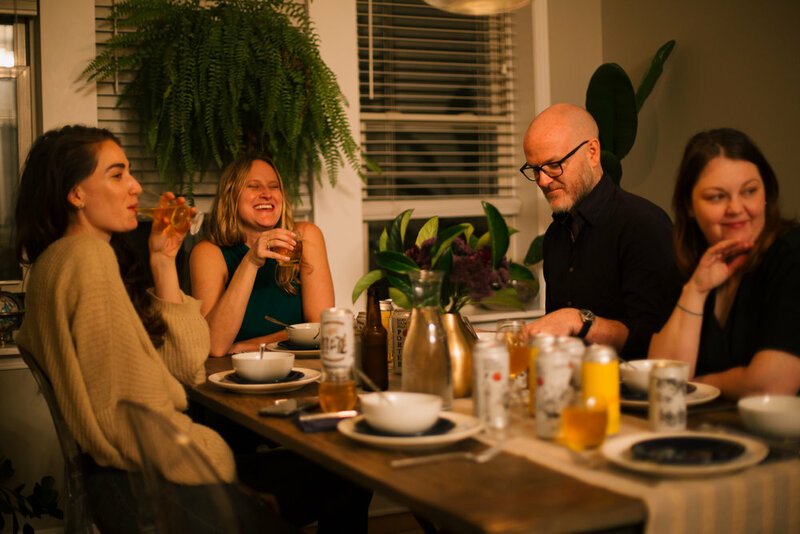 Hosting Thanksgiving in London means indulging in a private kind of make-believe, because little in the world around you suggests or supports the holiday. There are no days off work, no bags of cranberries on the shelves. Here, turkey is eaten for Christmas dinner, and pumpkin desserts are widely considered a moral outrage. Because adhering to tradition might require pre-ordering expensive birds from specialty butcher shops or trekking to the lone American store across town for Quaker Yellow Corn Meal, it’s easier to adapt than to reproduce a Norman Rockwell–style feast. And so my Thanksgiving has, over the last six years, evolved into some strange hybrid of tradition and novelty. I’ve jettisoned many of the classic staples in favor of food that more generally suggests harvest or autumn or the weighted-blanket pleasure of cold-weather eating. The menu’s different every year, and I like it that way. The indelible image of fall, for most, is leaves turning from green to canary to auburn to rust. Nebraska doesn’t really have trees, to the point that its citizens came up with a holiday to address the issue. Growing up in the Cornhusker State, when I think of fall, it’s the rows and rows of sawed-off corn stocks that come to mind. The remnants from harvest stand knee-high and jaggedly slash up a flat horizon, waiting for winter storms to finally knock them down for good. I haven’t been back to Nebraska to celebrate Thanksgiving for at least 15 years. After drifting from party to party, about a decade ago, I settled into an annual routine of making my way to the Southside of Chicago. There, I found a home for the holiday with a lifelong friend, Kyle, his wife, kids, and in-laws. The meals I now cook and share are radically different than the ones I had growing up. A Thanksgiving salad risks sounding sanctimonious—and leafy greens might seem antithetical to the holiday’s particular brand of gut-busting—but this warm mushroom salad has become my preferred way to begin the feasting. It has far too much butter in it to be truly wholesome, given that the chestnut mushrooms are fried until sopping and golden-brown. It also comes with curls of Parmigiano Reggiano and toasted hazelnuts, and is finished resplendently with an apricot-hued, soy sauce-cured egg yolk. (Puncture it with the tines of a fork and watch its liquid lazily yellow up your plate.) This salad is not incompatible with decadence. When thinking of a soup to open up this week-long Provisionspalooza, I couldn’t shake those smells of fall from my childhood. And I kept on coming back to corn. Not the form the grain takes as a staple of a Nebraskan summer, but the smell of the cornstalk after harvest. In my mind, the scent of a sun-dried stalk comes across as faintly toasted—it’s lighter than the vibrant, dense and vegetal characteristics of corn when it’s in its peak season. Considering the gluttonous nature of the dishes to come, I wanted my soup to be focused on a corn stock of a different character, keeping the dish light and sparking the appetite for the courses to come. And so I obsessed on the corn husk. I wanted to transcribe the smell in my head to a taste in a bowl. Toasting at 250, the husks don’t take long to finish. I found the best result was to lay the husks as flat as possible on sheet trays, and pull them from the oven when they were only mostly tan. A little green coloring on some husks and darker brown on the others wasn’t only acceptable, it was preferred. It added nuance to the final product and kept the toasted flavor restrained. To push the corn flavor forward, I cut the kernels from the cobs, using the cobs in the stock, and setting the raw kernels aside for later. A yellow onion and carrot rounds it out, giving some much-needed background character and depth of color. Finally, I found that roasted scallions added the right amount of sweetness to balance the toasted notes of the corn husk. To avoid the dish turning into a faux consommé at best and corn husk tea at worst, I decided the soup needed something more. I took inspiration from one of my favorite ramen toppings—kernels of corn and shredded Brussels sprouts sautéed in a hot pan. Corn cooked through would add small bursts of flavor, and sautéed Brussels sprouts, cooked in a pan hot enough to char some of the leaves, would add just a bit of bitterness. I’ve pounded through many bowls of ramen, and beyond being incredibly satisfying, they’ve held many a lesson in making incredible soup. From there, my thoughts shifted to aromatic oils. Sage plays a pivotal role in many a Midwestern small town Thanksgiving. When I realized my soup needed more of an aromatic punch, sage was a perfect choice. Infused oil would come very close to delivering the final piece of the puzzle. To make sure that the aroma adequately snagged my diners’ attentions, I decided to add a piece of fried sage to each bowl before serving, bolstering the aromatic qualities without overwhelming the prominent flavor profile and finishing the dish. Speaking of decadence, I find the best way to welcome visitors—on Thanksgiving or any other day—is with a large bottle of something sparkling. Cider makes a worthy aperitif, and Oliver’s Fine Cider, which is made in Herefordshire and fermented with wild yeasts, is fitting for the occasion. It’s mellow and lightly sweet, but has a dusting of funk that suggests, romantically, some picturesque English orchard. Alongside the mushrooms, it telegraphs total fall. Solemn Oath’s Lu is an excellent example of such a beer. For those that would prefer a bit more structure than the anarchy I suggest above, this Kölsch is a great opener. It will be familiar to those who haven’t explored craft beer at large, being reminiscent, albeit with much more flavor, to macro Lagers. With the more subtle nature of the corn husk soup, it won’t dominate the dish, but it also won’t get lost with the bold flavors to come. It has a light sweet profile and spicy bitterness. Not only does the beer finish clean, but it also readies the palate for the next bite. 1. Make the soy-cured egg yolks roughly 3 hours before you plan to serve the salad. In a small bowl, add the soy sauce, sake, and sugar, then stir to combine. Crack the eggs over a separate bowl, separating the whites from the yolks with your hands or with the shells. Gently place each whole yolk in the soy sauce mixture, being careful not to break them. Cover and chill. Save or discard the egg whites. 2. Using a dry paper towel or mushroom brush, clean any dirt or grit off the mushrooms. Remove and discard the stems, thinly slice the caps. 3. Place a large, heavy-bottomed frying pan (cast iron works well) over high heat. Once it’s very hot, add 1 tablespoon of butter. As soon as it melts, add just enough mushrooms to cover the pan in a single layer. (Be careful, as the molten butter may splatter). Don’t crowd the pan, as the mushrooms will steam and release liquid instead of properly browning. Depending on the size of your pan, you will likely need to cook the mushrooms in 4 or 5 batches. 4. Cook the mushrooms undisturbed for 3-4 minutes, or until they’re deeply golden brown. Use a spatula to flip the mushrooms, and scatter over a handful of thyme leaves. Cook on the reverse for 2-3 minutes more, or until golden. Transfer the mushrooms to a bowl and season to taste with salt and pepper. Repeat these steps with the remaining mushrooms, adding 1 tablespoon of butter to the pan for each batch. Once the mushrooms are cooked, cover and set aside. 5. Meanwhile, toast the hazelnuts. Place a small frying pan over medium-high heat, and add the nuts. Toast, tossing frequently, for 5-6 minutes, or until they’re golden brown and smell fragrant. Remove from the heat and leave to cool for 10 minutes. Once cool enough to handle, chop roughly and set aside. 6. Shortly before you plan to serve the salads, make the dressing. Add the minced shallot and vinegar to a bowl, and let sit for 10 minutes. Slowly whisk in the olive oil in a steady stream. Season to taste with salt and pepper. 7. Just before serving, check the mushrooms for seasoning and heat. iIf they’ve cooled slightly, transfer them to the original frying pan and warm through for a few minutes over low heat. Meanwhile, remove the soy-cured egg yolks from the fridge. 8. When ready to serve, divide the salad leaves between six plates, and sprinkle over the chopped tarragon. Season the greens with a pinch of sea salt and a small drizzle of dressing. Top each plate with the warmed mushrooms, and drizzle over more dressing. Garnish with the Parmigiano Reggiano and the chopped hazelnuts. Finish each plate by carefully spooning a soy-cured egg yolk on top. 1. One week to one day ahead, place a bunch of sage into a glass jar. 2. Heat 1.5 cups of olive oil to 160 degrees. Carefully pour hot oil over the sage in the jar, cover with a lid and set aside. 3. Preheat oven to 250. 4. Cut off the top and bottom ends of each ear of corn. This will help with removing the corn husks. Discard the tops of the corn, rinse the bottom and add to your soup pot. Remove the husks and set aside. Clean as much silk from the ears as possible, and reserve the ears for later use. 5. Lay the individual leaves as flat as possible on a cookie sheet. Avoid overlapping the leaves. Place in oven and check after 5 minutes. Remove when husk leaves are beige to very light brown. 6. As husks toast, remove kernels from the ears of corn. Place bottom of an ear of corn in a mixing bowl at a 45-degree angle. With a knife, carefully slice downwards to the bowl, removing kernels in strips. The mixing bowl should catch all kernels. Add stripped ears to your soup for the stock pot. Once you have all your kernels in a bowl, spot check and remove remaining large pieces of corn silk. 7. Slice Brussels sprouts in half the long way. Cut the sprouts into ribbons from the top to bottom of the vegetable. 8. Once all corn husk leaves are toasted, turn oven up to 400. Place scallions on sheet tray and roast until brown. 9. Place all toasted corn husk leaves in a soup pot with garlic, bay leaves, carrot, and onion. Cover with water. Bring to a boil, then turn down to a simmer. Simmer for at least 3 hours. 10. Add an inch of oil to a small pot or sauté pan. Once the oil is very hot, add a sage leaf and fry until the bubbling starts to dissipate. There should be 1 sage leaf per bowl of soup. Set fried sage leaves aside on a towel to drain. 11. After 3 hours, remove all corn husks, vegetables, and herbs from the corn stock. Keep stock handy while assembling the soup. Taste and season with salt as necessary. 12. Sauté corn and shredded Brussels sprouts in butter. Cook shredded sprouts to desired texture. Season to taste. 13. Add corn and shredded Brussels sprouts to bowl, cover with corn stock. Drizzle a spoon full of infused oil on top of the soup. 14. Finish it all up by placing one fried sage leaf in each bowl.